The Relentless Reader: Recent Read: Why Be Happy When You Could be Normal? Recent Read: Why Be Happy When You Could be Normal? Why Be Happy When You Could Be Normal? 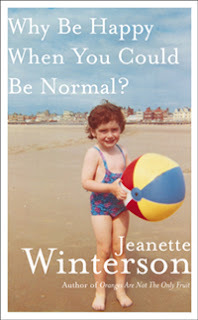 Jeanette Winterson's mother asked her that question when she explained that she was a lesbian and that being with her girlfriend made her happy. There are many twists and turns throughout this memoir that make you cringe in empathy for the author. I'd love to spill some of them but that wouldn't be very nice of me now would it? You'll just have to read it for yourself. If you do, I'd love to hear your thoughts! I'm a huge Winterson fan anyway, but even the first chapter of this book makes me fall in love with her writing all over again. She has such a powerful way of expressing emotions, be they lacerating good or witheringly sad. I *really* need to pick up Oranges Aren't the Only Fruit by her. I can't believe I haven't read that yet! Loved this book, anything she writes really. I'd sure like to read more by her...one of these days!